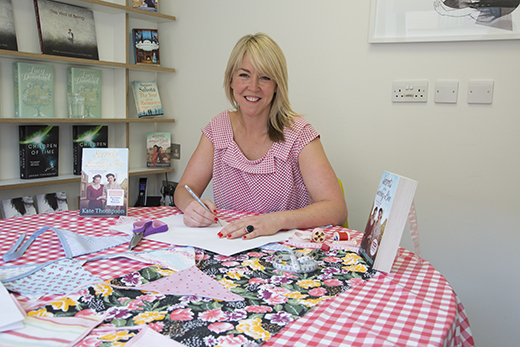 Kate Thompson, author of Secrets of the Sewing Bee, shows you how to make your own bunting in a few simple steps. remember the street parties of yesteryear? trestle tables groaning with sandwiches, cake and jelly, union jack flags fluttering from every gas lamp and acres of bunting hoisted high over the cobbles? nothing evokes the nostalgia of the past more poignantly than black and white photos of a good old community knees up. but why should these things be consigned to the past? this weekend, the nation readies itself to celebrate the official 90th birthday of her majesty the queen. why not celebrate the milestone birthday of britain's longest reigning sovereign by getting your neighbours together and arranging your own street party? or perhaps you’re taking part in this sunday’s big lunch; where people are encouraged to sit down to eat with their neighbours in streets and community spaces? however you are celebrating, why not try your hand at making your own party bunting to add a cheerful splash of colour to the weekend’s festivities? here’s our easy peasy, step-by-step guide. lay fabric out with any patterns facing up. lay your pattern pieces onto the fabric as instructed. cut as many flags as you would like to. i made 6 flags so cut 12 pieces of fabric out. and that is it! your bunting is ready to be hung up in time for her majesty’s birthday and all those summer garden parties and bbq’s. you can get kate thompson's secrets of the sewing bee on your kindle for just 99p until the end of june. read chapter one here.